Today I bring you a sandwich that I just love! I honestly can’t believe how long it has taken me to share it with you. 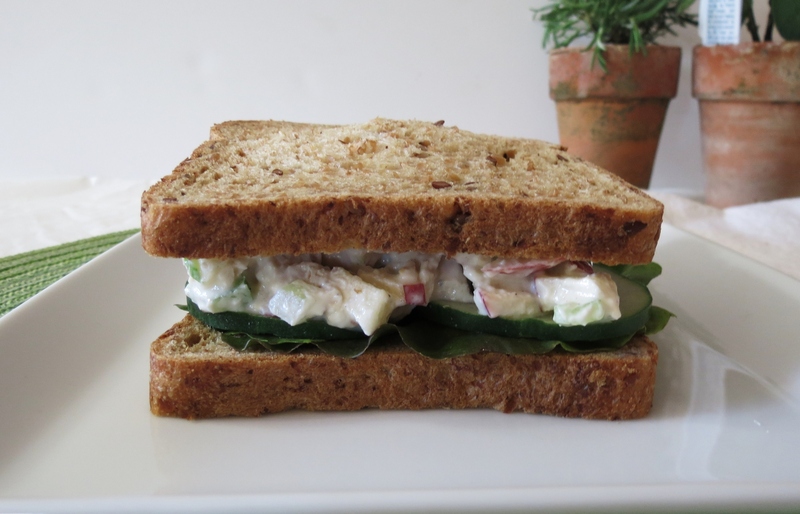 This chicken sandwich is healthy, full of flavor and just plain yummy! The story behind my sandwich: Back in my late 20’s I used to work for a construction company and just down the street from work was a cute little bakery I just adored. All of their bread was homemade, everything was fatty and oh so good! The pastries, don’t even get me started, lets just say nothing beats homemade pastries from a bakery. Back in my days when I didn’t count calories or really care about weight I would go there and buy a Chocolate Chip Cookie, you know the big ones and a California Chicken Sandwich. 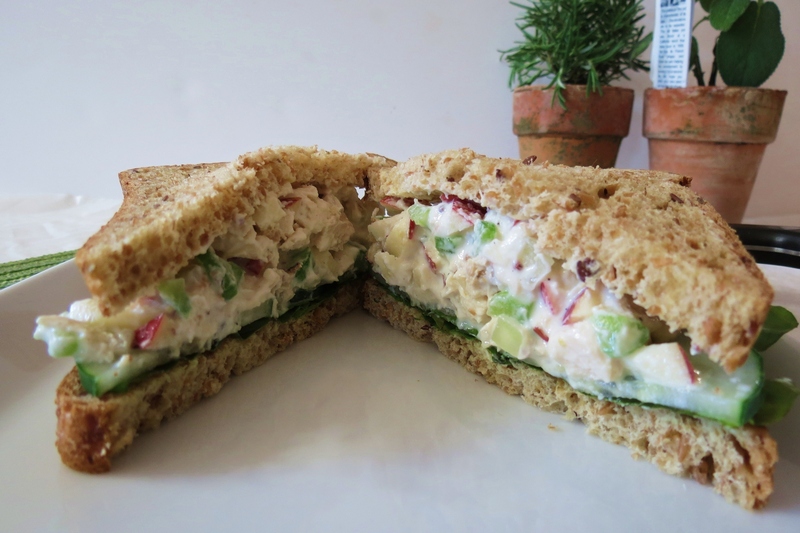 The sandwich was on thick white bread and topped with a chicken salad made with mayonnaise, apples, grapes, nuts, celery and onions. They topped the sandwich with cucumbers, lettuce and sprouts. Oh my gosh, I loved this sandwich! Lucky for me the bakery closed that location and opened up a restaurant, which was just a pinch to far for me to walk, so I missed my sandwich. Ever since then I created my own version, which I am sharing with you today. 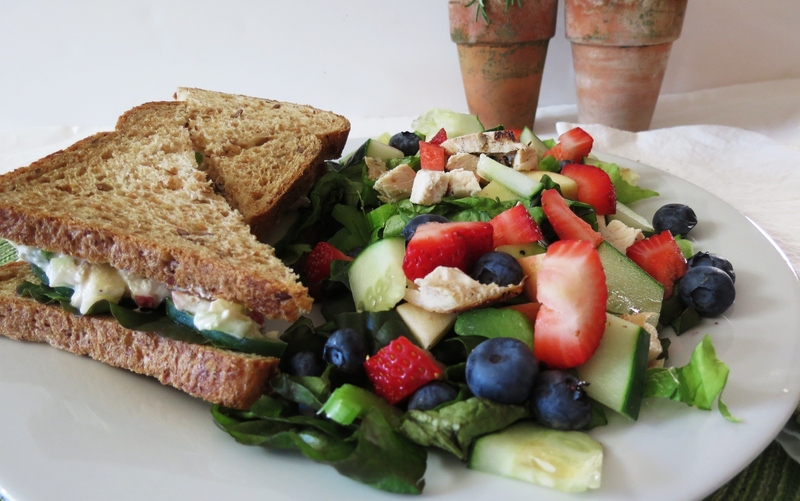 Now that I am more health conscious, I decided to take the sandwich I love and make it guilt-free. 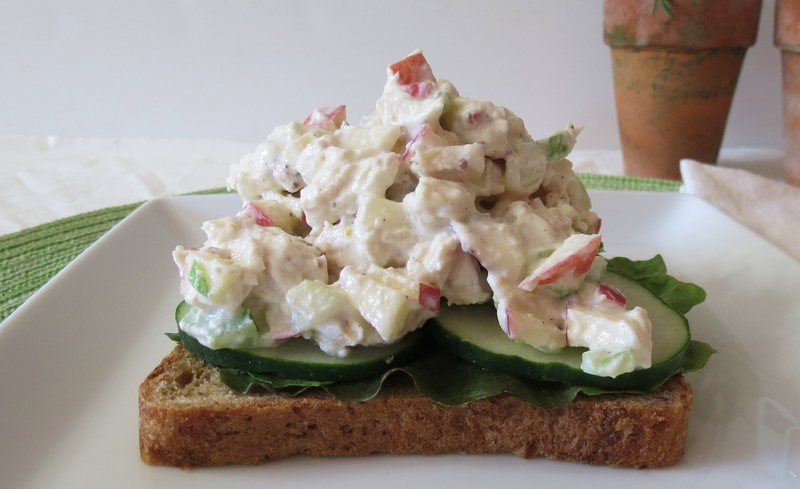 Instead of white bread, I used 50 calorie a slice whole wheat bread with Flax Seeds, skipped out on the mayo and used greek yogurt, and the rest of the goodies on the inside are healthy like chicken, apples and celery. I would top my sandwich with sprouts but I didn’t have any so I used lettuce, and cucumbers. I am so happy with my sandwich. I have been eating it the healthy way for years. 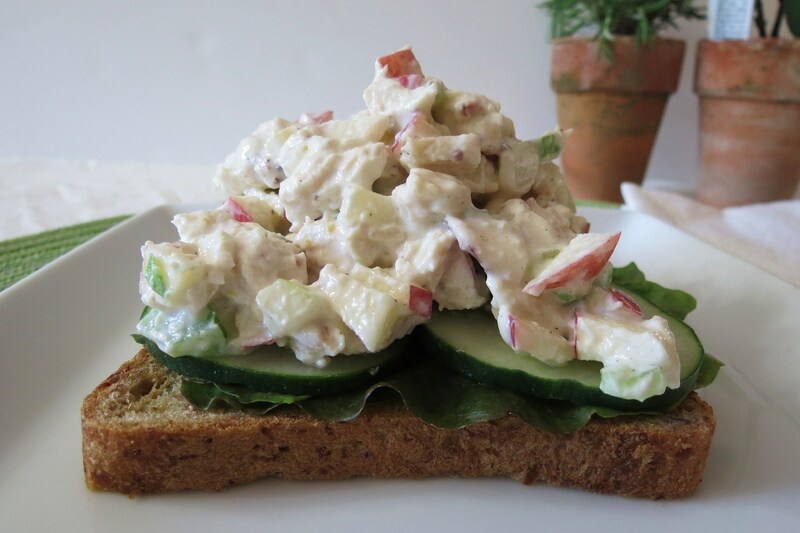 During the seasons, and mood changes, sometimes I’ll add candied walnuts or cinnamon in the chicken salad to add a little more depth in flavor. Today I kept it simple! Since this sandwich is only 200 calories I sided it with a homemade fruit salad topped with chicken and a champagne vinaigrette dressing. This makes a perfect lunch or dinner combination. I have to show a close up of all my chunky goodness!! If you’re not a fan of bread this would also be wonderful topped on crackers or on a salad. If you don’t like Greek Yogurt, which is crazy, use fat free mayonnaise. The possibilities are endless!! 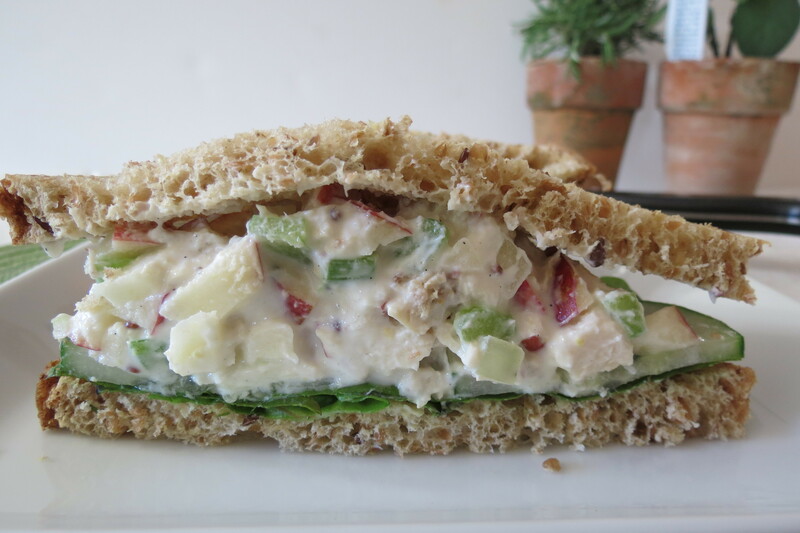 A healthy, creamy chicken salad sandwich made with chicken, apples, onions, celery and greek yogurt. 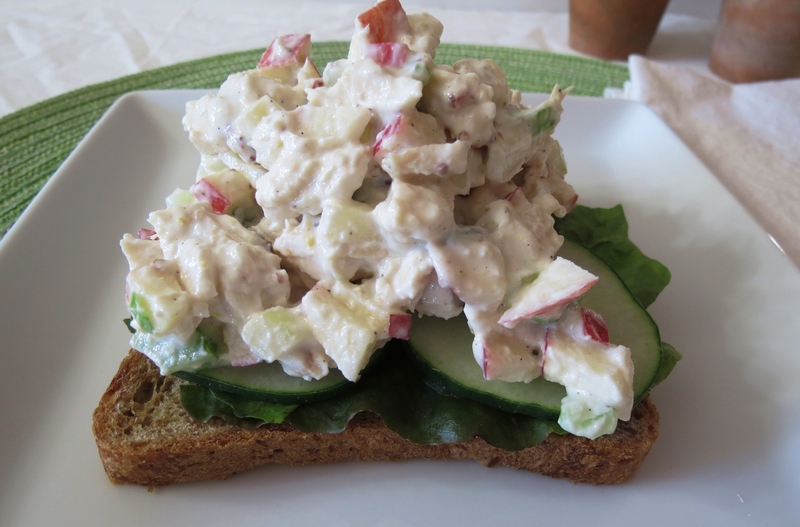 In a bowl add chicken, apple, celery, greek yogurt, mustard, salt and pepper. Mix carefully until combined. I’m writing my post a day early, so I need to make a potato salad for my Boss’s BBQ party. Plus I have to make dinner. I hate when I don’t know what to make. If I had chicken, I would so be making this sandwich! I think this sandwich is going to have to go into my weekly rotation. It looks delicious! I love chicken salad. Only wish I could get the bread where I live, as that looks good too! Would you mind posting another link or telling me what the name of the bread is? This link isn’t working for me but that sandwich looks amazing!